This title is suitable for children of ages 8 to 12 years. Over 200 years ago, Charles Darwin, a naturalist, dedicated his life to what he loved most- science and nature. With his dream set firmly in his sights, Darwin embarked on the journey of a lifetime. After years of observation and research, Darwin went on to write the world famous, "The Origin of Species", published over 150 years ago, that forever changed the way we view the world around us. Follow along as young Charles Darwin battles seasickness, rides giant tortoises and even hides bugs in his mouth - all in pursuit of his dream - to change the world through science. 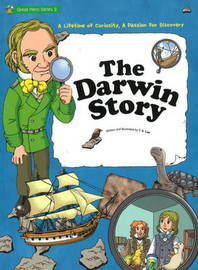 Join Darwin as he sets sail toward his dream.